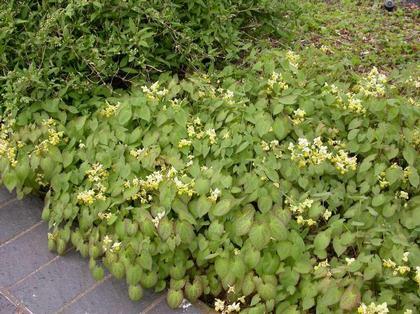 Why we love epimediums: the delicate foliage that floats on almost invisible dark petioles, their toughness in dry shade, the range of flower colors--white and yellow to reds and pinks, the heart-shaped leaves with contrasting veins, the beautiful fall foliage color. Really, what else could you possibly want? Bicolor buttercream flowers on sprays held above heart-shaped veined leaves. Mounding habit.